The euro vs dollar continues to flirt with the 1.440 price handle, teasing the forex market with an initial push higher, only to fall back exhausted in later trading, and today’s price action has replicated this once again, promising much in the morning, only to fail to deliver later in the day. However before we assume that this level may prove to be an immovable barrier to any move higher for the euro vs dollar, it is important to note the role of the 40 day moving average, as once again yesterday it provided the platform for a push higher following the wide spread down bar of the previous day, and creating once again a series of lower highers as we edge on up towards this price level. Yesterday’s candle also closed above the 14 day moving average, but marginally below the 9 day average. If today’s candle holds firm then this will be another in a long series of failures to break through the 1.44 barrier, and each time we see a failed attempt on the daily chart then this adds to the likelihood of a move lower. However, don’t be fooled by this apparent weakness – the euro vs dollar has a nasty habit if doing the exact opposite when you least expect, and remember that the 40 day moving average, whilst a weak signal, is still there in the background. The main news today was of course the ECB rate decision, and it came as no surprise to the forex markets that rates were kept on hold once again at 1.o%. In the accompanying statement, Jean Claude Trichet, said that any rebound was “expected to be uneven” both “inside and outside the euro area”, but that recent economic indicators and fundamental news was beginning to suggest that the worst was over for the European member states. 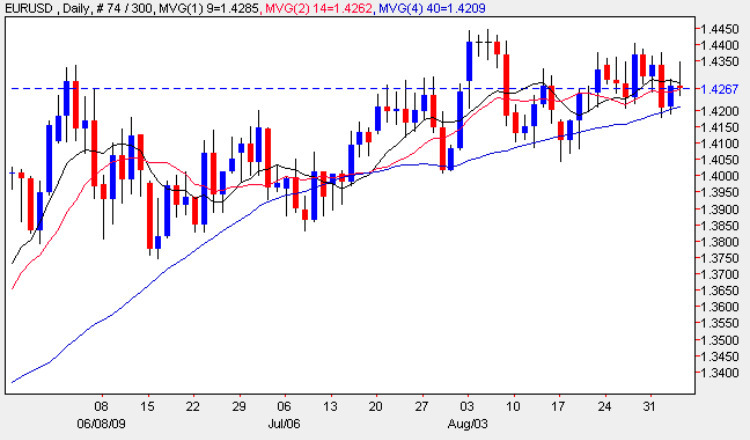 There was little forex market reaction to the news either to the rate decision or following statement. Meanwhile in the US markets the main fundamental news items on the economic calendar included the weekly unemployment claims which came in worse than expected at 570,000 against a forecast of 563,000, whilst the ISM Non Manufacturing Index was marginally better at 48.4 against a forecast of 48.3, as we claw our way ever closer to the magic 50 which indicates an industry in expansion rather than one in contraction.